Although stress and lifestyle can make ulcers worse, the main cause is a tiny, spiral-shaped bacteria called Helicobacter pylori (H. pylori). These bacteria penetrate your stomach’s protective lining, making it more susceptible to damage from digestive acids. They also cause your stomach to produce more acid, contributing even more to the development of a painful ulcer. Your doctor can do a simple blood test to see if you are infected with H. pylori. If you are, he’ll probably prescribe antibiotics to kill the bacteria, and he might recommend the following lifestyle changes. Stop smoking. Cigarette smoking increases your risk of developing an ulcer. It also makes existing ulcers heal more slowly and raises the chances that your ulcers will return after they’ve finally healed. Can the coffee. Many beverages and foods that contain caffeine, like coffee, tea, and colas, may cause your stomach to produce more acid than usual, making your ulcer pain worse. Limit stress. Although stress is no longer consid­ered the major cause of ulcers, many people with ulcers say that emotional stress increases the pain. 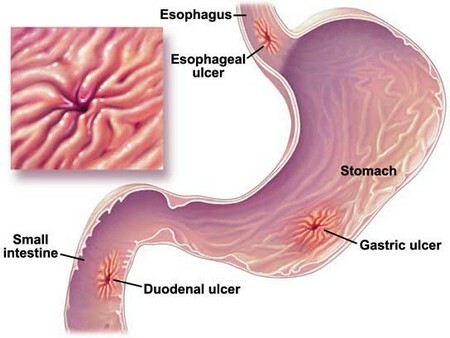 Physical stress, such as surgery or a serious injury, may trigger the formation of ulcers. Don’t overdo NSAIDs. Nonsteroidal anti-inflam­matory drugs (NSAIDs) can undermine your stom­ach’s natural protection. Aspirin and ibuprofen are common NSAIDs taken for arthritis, headaches, or just minor aches and pains. If they are causing you stomach pain, ask your doctor about switching to another type of pain reliever.